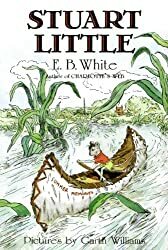 When I was a kid, I enjoyed Charlotte’s Web so I wanted to read another E. B. White book. I have not seen the Stuart Little movies either. This was a nice little children’s book which is written more of a series of short stories on the adventures of Stuart Little. I liked most of the stories. The characters were sweet and I liked the New York City setting too. Margola the bird and the Little parents were lovely. Stuart has a big personality too and it borders on being egotistical. It was amusing until one of the last stories where he develops a crush on someone. It is relatable but he then becomes defeated when things don’t go his way. The story ends there and rather abruptly. The novel too ends on a bit of a cliff hanger. You can tell White was done with the character and stories by then so he just gave up without much of a ending. All in all, still a sweet and nice children’s novel.